Fifteen interactive games on grammar, spelling and punctuation! Create confident readers and writers with Grammar Games; colourfully animated games for children to practice key grammar concepts taught in the classroom at home. 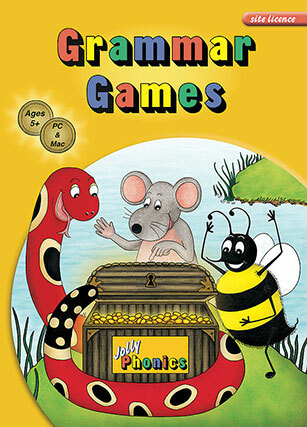 Grammar Games manual (for more details of the games, navigation and system requirements). PC: Microsoft® Windows®, Vista® (SP2), Windows 7 or 8, Windows Server 2008. 2.33GHz or faster x86-compatible processor, or Intel® Atom™ 1.6GHz or faster processor for notebook class devices. Mac: OS X® 10.7, 10.8, 10.9, 10.10. Intel Core™ Duo 1.83GHz or faster processor. Minimum 512MB of RAM is required for both Mac and PC. You must have Administrator/Privileged Access Rights to install this software.